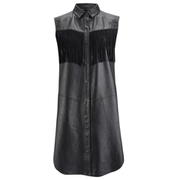 Leather shirt dress from Ganni. Designed in a sleeveless construction with Native American inspired suede fringed detail across the chest and back and chevron seams. A collar, concealed snap fasten placket front and a rounded hemline feature. Unlined. Shell: 100% Lambskin Leather. Trim: 100% Cowhide Leather. Size S length: 35.75”/91cm.